Click here to make an online payment donation. to a school of their choice in support of extracurricular programs and get their entire donation back in the form of a tax credit. 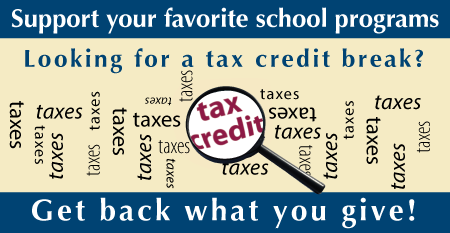 Taxpayers who donate by April 15 can choose which calendar year they want to apply the credits. For example, a donation can be applied to either 2016 or 2017. *Individuals and couples filing jointly may take advantage of this tax credit. A maximum of $200 can be deducted per individual tax return; couples filing a joint return may deduct a maximum of $400. CONTACT YOUR TAX ADVISOR FOR MORE INFORMATION. The credit is applied against the taxpayer’s state income taxes. Checks must be made payable to the school. The credit is available for any personal income tax return. It is not a requirement that the taxpayer have a child enrolled in the public school. The credit is limited to $200 per individual tax return and $400 if the credit is claimed on a tax return of a married couple.